The Abarth is a racing car and road-going automotive maker founded by Carlo Abarth of Turin, Italy in 1949. In the 1950s world of small sports car racing, the Abarth Company was king. Perhaps best known for its association with Fiat, Abarth quickly built up an extensive reputation as the premier tuner of Fiat engines and was branching out into many classes of motor sport by 1956. 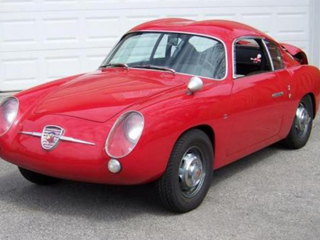 One of the best-known Abarth classics is the 1958 and 1959 Fiat Abarth 750 Zagato, which is also known as the Abarth Double Bubble and was used to compete in the 750cc class of the Grand Touring Championship. Thanks to Zagatos weight saving body, the first cars weighed just 1,179 pounds and took advantage of Abarths 747cc tuned engine. With a high compression head and a specially made exhaust, power was exceptional for its time. A number of prototype cars were manufactured in 1956 and one of these would appear at the 1956 Mille Miglia, which would place second in class. The production version of the 750 Zagato would appear at the 1956 Geneva Motor Show. The twin intake scoops at the back and the double bubble roof were the most distinctive features of the car, and in typical Zagato fashion, the aluminum body was equal parts bizarre and gorgeous. This styling would give the Abarth 750 a quite unforgettable appearance. Looking to purchase an Abarth? When buying a classic Abarth, it is important to partner with a leading member of the classic car industry to ensure your success. Backed by years of experience in the industry, The Beverly Hills Car Club a renowned Los Angeles classic car dealership has the professional connections, knowledge and experience to assist you in finding the classic Abarth you desire. In addition to the Fiat Abarth 750 Double Bubble, other models that may be of interest include the Fiat-Abarth 1000TC and Fiat-Abarth 850TC, the Abarth 1100 Scorpione Spider, the Abarth 204A and 205A Berlinetta, the Abarth Simca 1300 GT, the Fiat-Abarth OT1000, OT1600 and OT 2000, and the Abarth Mnomille to name just a few. To learn more about Abarth classics or to explore the current Abarth models in their Los Angeles classic car dealership inventory, The Beverly Hills Car Club welcomes you to contact them today. Renowned for their fair and honest car deals, they look forward to hearing from you and to helping you find the classic you desire. Connect today to get started! We Also Buy Classic Abarths In Any Condition, Top Dollar Paid.